Sister John Catherine Rohe, S.S.F. 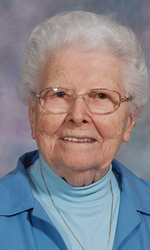 Sister John Catherine Rohe died April 9 in Assisi House, Aston, at age 96. She had been a professed member of the Sisters of St. Francis of Philadelphia for 76 years. Sister John Catherine (Florence Mary Rohe) was born in Baltimore, Md. She entered the congregation in 1935 and professed her first vows in 1938. Two of her sisters, (Sisters Alice Joseph Rohe and Alice Catherine Rohe) and three cousins (Sisters Doris Barlow, Ellen Patricia Rohe, and Jean Clare Rohe) also entered the congregation. All with the exception of Sister Jean Clare are now deceased. Sister John Catherine ministered in education on both elementary and secondary levels and as both teacher and principal. She began her many years in education shortly after her entrance, teaching at St. Anthony School in Trenton, N.J. (1935-1936). She ministered for 19 years in what is now the Diocese of Allentown, teaching at Allentown Central Catholic High School (1953-1957) and Reading Central Catholic High School (1957-1972). She also taught for many years in the Archdiocese of Baltimore, Diocese of Pensacola-Tallahassee and the Archdiocese of Washington. In 2007 Sister John Catherine moved to Assisi House, the congregation’s retirement residence in Aston, where she served in prayer ministry until her death. The funeral Mass was celebrated April 14 at Assisi House. Burial was in Our Lady of Angels Cemetery in Aston. Sister John Catherine is survived by her sisters, Mary Blondell, Irene McCafferty, Margaret Muller, Shirley Manubay; nieces and nephews; cousins; and by her Franciscan family.